Anne of Denmark stands facing half to the right, wearing a green riding habit and a tall-crowned hat with red plumes. She restrains five greyhounds on a leash in her left hand and rests her right hand on her hip. The greyhounds have her initials, AR, on their collars. Her green low-cut bodice has curved sleeves in the fashionable Spanish style, one of which is worn hanging with the buttons undone. Her bodice is trimmed with multiple layers of lace at the cuffs and neckline and she wears practical leather riding gloves. A black groom wearing scarlet and gold livery holds her horse to the left. Queen Anne is depicted standing in the grounds of Oatlands House, with the palace visible in the distance to the right. An owl, symbol of wisdom, perches on a tree above. A scroll inscribed LA MIA GRANDEZZA DAL ECCELSO floats above the Queen's head. This motto ('My greatness is from on high') was a favourite with the Queen. In the same year that this portrait was painted Inigo Jones completed his alterations at Oatlands for the Queen, including the classical gateway which is visible here. The painting can be interpreted as a tribute to the Queen's love of building and patronage of Inigo Jones as well as a display of her passion for the chase and a deliberate advertisement of the Divine Guidance with which she felt herself inspired. 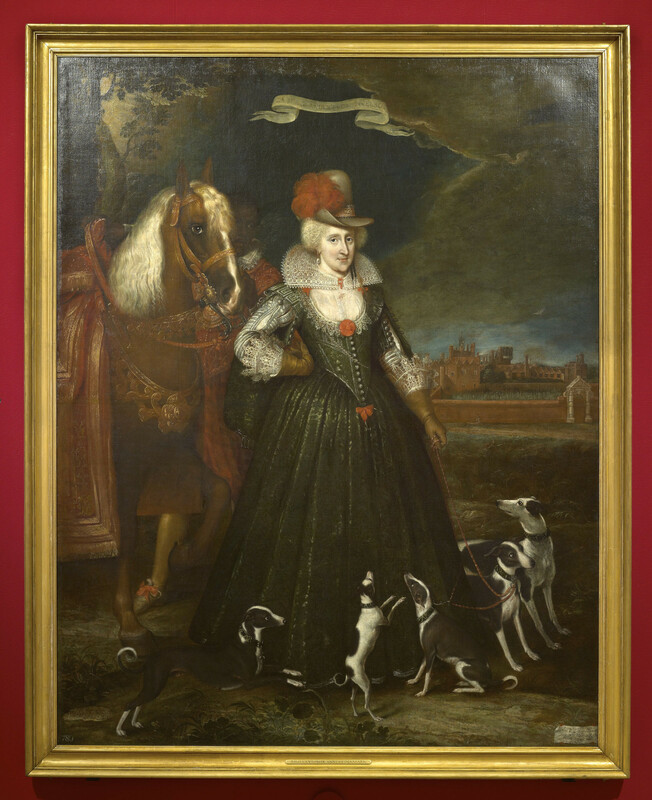 This portrait was painted for Queen Anne in 1617 and listed as being at Oatlands on 7 October 1617 when it was described 'In ye gallery next ye vineyard her Mats owne picture, wth her horse by her, done at large'. Later it hung in the Bear Gallery at Whitehall. It was sold to Jackson and others on 23 October 1651 and recovered at the Restoration. Thereafter it was hung at Whitehall, Windsor, Kensington and Hampton Court.